Buy only what you need. Don’t buy a gallon jug of paint thinner when you only need a pint. The gallon will not save you money if you don’t use it. Use the least toxic material for the job. Materials labeled WARNING or CAUTION are less hazardous than those labeled DANGER or POISON. Share. Pass left over materials on to friends and neighbors who will use them rather than store them. There are several reasons to re-think the way we care for our lawns. The phosphates in fertilizers contribute to blue-green algae blooms in Lake Champlain, and the chemicals in pesticides and fungicides can pose a hazard to our families, pets and the environment. Listed below are resources to help you manage your lawn and garden in ways that will keep it both beautiful and healthy. Before applying fertilizers, why not save yourself some money and have your soil tested to determine what it needs. The University of Vermont provides soil tests for a small fee, and results are available in five to seven business days. Forms and additional information. 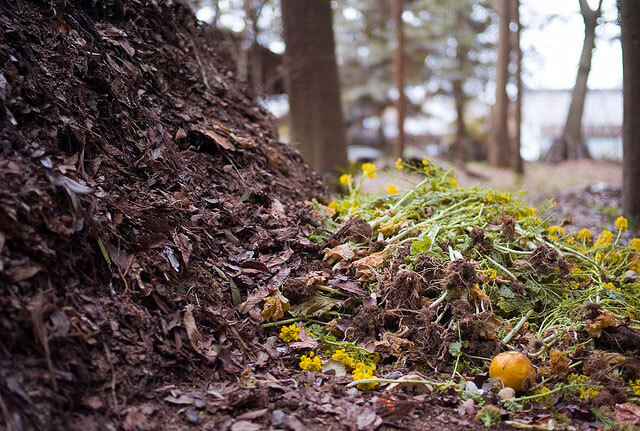 Compost is 100% natural, cheap, and it won’t contribute to phosphorous run-off in the lake. Visit NWSWD’s Composting 101 for information on how to make your own compost. Another alternative to fertilizers is vermicompost tea. It’s made by adding worm castings to water and pumping air through the water. Sprinkle the water on areas that seem in need of an extra boost as well as houseplants and gardens. Vermicompost tea kits are available from most area gardening supply outlets. The simplest way to fertilizer your lawn is to leave the clippings where they fall. Microbes, worms and other fauna involved in decomposition will break those clippings down into an ideal mix of nutrients for your grass. The simplest way to beat weeds is simply to mow high (3-4 inches). Longer grass will shade the weeds, depriving them of the sunlight they need to prosper. Cutting too low can also weaken your grass plants. The blades are where the plant makes its food and if they’re too small the grass will grow faster to compensate. This fast growth uses up resources the plant could be using to make new plants. Watering infrequently, as strange as it sounds, actually makes for stronger grass plants. The plants are forced to grow their roots in search of water, and dig down deeper than most weeds can manage, leaving the weeds more vulnerable to a dry spell than your grass. Lawn to Lake – Information on how to minimize the impact your lawn has on Lake Champlain. Vermont Master Gardener Program – Information on becoming a Master Gardener as well as articles about gardening and lawn care. Less Lawn – Information on reducing your lawn and the time and resources involved in maintaining it. Many of the cleaners we have in our homes contain chemicals that can be hazardous to people, pets, and the environment. Perchloroethylene, found in many spot and carpet cleaners, is known to cause cancer in animals and is considered a possible human carcinogen. Other chemicals, such as phenol in disinfectants, can cause kidney and liver damage. The EPA has a more complete list of the potential hazards found in household cleaners. Making your own household cleaners is a good way to both save money and protect your family from potentially toxic chemicals. However, even non-toxic cleaners are still cleaners, and need to be properly labelled and stored away from children. Here’s a great video from howdini.com detailing how you can “green” your household cleaning. Also, here’s a PDF from Central Vermont Solid Waste Management District with recipes for making non-toxic household cleaners. Instructions for making a Green cleaning kit. Kids can take a tour of their house with the EPA, identifying toxic materials as they go. Adults can take advantage of a program designed by EPA and Purdue University to help identify ways to reduce waste and save money in their homes.